Prince Albert, who arrived here on Monday on a week-long India visit, met the prime minister at Hyderabad House here. 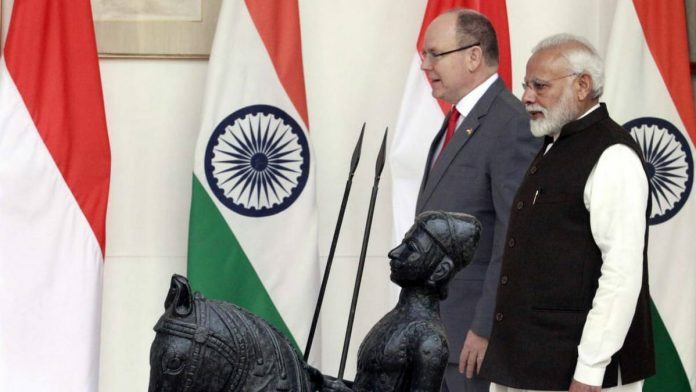 New Delhi: Prime Minister Narendra Modi on Tuesday held wide-ranging talks with Monaco’s reigning monarch Prince Albert II and discussed stepping up cooperation, especially in the renewable energy sector and in combating climate change. Earlier in the day, External Affairs Minister Sushma Swaraj called on Prince Albert and discussed opportunities for cooperation in the areas of environment, specially renewable energy, investment into India, smart cities, marine ecosystems, tourism and people-to-people contacts, Kumar said. The visiting dignitary will proceed on a private tour of India after his official engagements and leave for home on February 10.